Cleveland knows press conferences. Don't know much about playoff seeding and parades, but, dear God, we know how to roll out a new coach. And with Twitter, the whole process is much more fun than it was ever meant to be. In fact, the whole damaged NE Ohio sports fan persona has found itself inside social media. We have to be the only fan base in America that happily makes fun of its own football team...while said team is playing, no less! Interestingly enough, on those rare occasions when the Browns are dominating, things get quiet. We don't know how to react, other than a tweet about how funny it will be when we blow this lead. Just like our beloved franchise, we haven't learned how to win yet either. 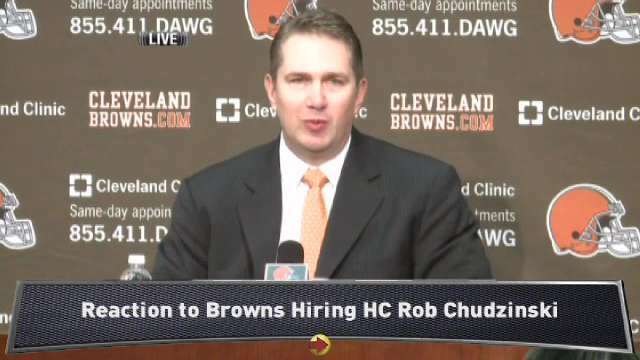 But we are very adept at mocking our ownership, players, coaching staff, subsequent coaching searches, and media (specifically Tony Grossi and Mark Kay Cabot- both solid reporters that seem to catch more venom than a Pat Shurmur-progress-play for five yards on 3rd & 9). So, here we are "welcoming" yet another coach while worrying that farewell is coming faster than you can say 2015. 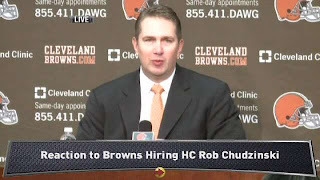 You say Goodbye, Chud says Hello! !